Accommodation is one of the critical components of an education in Bangalore. A good student housing allows the student to take their minds off day to day living issues like power, food transportation to college, laundry and security. We ensure that students dwell in a healthy environment that helps them to grow and learn without any obstacle. Parents are at peace knowing their child is well cared for and secure in a nurturing and homely environment. Operating and managing the kitchen and food for students. Allocation of places in accommodation and providing information and guidance regarding accommodation options. To monitor the well-being and discipline of the student. To create and introduce new facilities and processes based on feedback from students. Accommodation for boys and girls are provided separately with all modern amenities. Students are requested to book their preferred choice of location and type of accommodation well in advance to secure their choice. Hostel rules have been framed keeping in mind the local culture and traditions, with a view to guide and help students to attain standards of implacable conduct. Therefore, while residents enjoy the maximum freedom, it is ensured that this is always within the framework of standard guidelines and procedures. 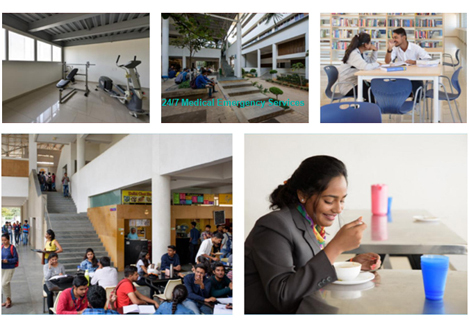 CMRU and CMRIT Offers Hostel Facilities for students studying in the CMR group. The Hostel is Located within the campus and situated in the most happening place in Bangalore, surrounded by IT companies and has access to all the amenities. Four sharing with common toilets. Extended library facilities till 12:00am during examination. The hostel warden will inspect your room and make the room allocations prior to student’s arrival. Room allotments are normally valid for the entire academic year. Students must occupy rooms specifically allotted to them. Students shall not shift/move to another room without the written permission of the warden. If a room change is necessary, such requests explaining the reason for the request can be made to the Warden of hostel. Approval of room changes is the sole discretion of the Warden. The warden reserves the right to change or cancel room assignments of students in the interest of health, security, discipline, improvement of the educational environment, the general welfare of students or as needed. Any damage to hostel property including driving of nails and defacing the walls, fixtures of furniture will be made good by recovering the cost of repair of damage from the individual concerned. In cases where responsibility for such acts cannot be defined, a common fine will be imposed on all the residents. The hostel warden will assist if any repairs in the room. Maintenance staff can be called only if a work orders is initiated. Please report all necessary repairs immediately to the Warden, so that potential problems do not become worse. Students are advised to take enough measures to protect their personal belongings since the hostel cannot hold the responsibility of protecting personal property of the students. The hostel will not be held liable, directly or indirectly, for the loss of personal property due to theft, damage by fire or water, or any other cause. Protect valuable items by keeping room locked and advised not to keep money and other valuables in open. Money, ATM cards, Bank Pass books etc. may be safely kept inside the locker. Students should bring their own locks for their rooms and for the lockers that are provided to them. Wardens may ask the students to shift their belongings for maintenance work or during an emergency. A cloak room type facility for the safe custody of the students’ belongings at owner’s risk may be arranged during such times. The use of electrical appliances in the room is strictly prohibited. Conservation of energy and resources is a major concern of the hostel system. Use lights only when needed. Turn off electrical equipment when not in use. Report any problem with the electrical equipment to the hostel office. Use water only as necessary. Completely turn off all water taps when are not in use. Drying of clothes on railing, a parapet walls, in the corridors and inside the room is strictly prohibited. Students have to use the laundry facility. Additional Laundry coupons can be availed by paying extra fees. Student and his/her roommate(s) are responsible for the care and cleaning of the room. Room must be kept clean and tidy for health and safety reasons. Residents shall cooperate in maintaining the common area and premises clean. Deposit all waste/rubbish in the waste bins provided. Keep soiled linen out of sight. Discarded rags, papers must not be thrown about in the rooms, terrace or premises. You are advised not to leave any items like paper, covers of toilet soap etc. in the bathrooms. Use the dustbins provided. Students should discard the sanitary napkins, tissue papers and other waste in the dustbin only. Students will be respectful, courteous and shall use appropriate language and etiquette at all times. Students should compulsorily wear their identity cards around their neck so as to clearly display their identity both within the campus and hostel. The student may also be required to surrender them on demand by authorities. Students not wearing ID cards will be given a warning the first time. For repeat offenders, disciplinary actions will be taken. Same conditions apply for students who do not report for attendance. 8:00 AM to 4:30PM is considered as compulsory college working hours. Students shall not remain in their hostel rooms during class hours (8:00AM to 4:30PM) or during central events happening in the campus except on permitted medical reasons. Students who wish to stay back in the hostel on working days for whatever reason should take prior permission from the warden. Any student who wishes to leave the college premises (to go back to the hostel or elsewhere) during the working hours should obtain an approval letter from the Counsellor / HOD / Dean. Students, who have proper authorization from concerned authorities, are the only ones who are allowed to stay beyond 8:00pm. After dinner, all the wardens will take a second round of attendance to ensure that the students are back in their respective hostels. The attendance is taken at 9:00pm. Students going home should obtain permission and approval should be taken one day prior from their respective wardens duly signed HOD’s. The wardens of the hostel should call the parents of the student to inform them that the students have left the hostel. The students returning from their homes after weekend visits should be back no later than 8:00PM, if they are returning in the evening unless they are accompanied by their parents/ guardians. Students shall inform the warden of their arrival as soon as they reach the hostel after leave. Students should also bring a letter signed by their parents that indicates the date and duration of their stay at home. On Holidays / Sundays, students need an out pass signed by their warden stating the purpose, time of departure and expected arrival time irrespective of whether they are going for entertainment or shopping. Students are responsible for the activities that occur in their hostel rooms and the shared living spaces where applicable. Therefore, students are expected to properly secure their living area(s) at all times. All assigned occupants of a room may be subject to the same sanctions under this Code as the actual violators. Students can cancel leave availed and return to the hostel. However they should inform the warden about their arrival immediately on arrival in hostel. Students shall inform the warden over the telephone and a written mail from the parent to the hostel administrator for any extension of leave. Residents are not permitted to own any motor vehicles on campus but special request with prior permission from parent & hostel office. No circular or subscription list shall be taken around except with the permission of the Warden. Students should refrain from any activity that is likely to infringe on the privacy of others or interfere with their studies. Students shall treat the hostel and mess staff politely. Students should not demand any special services by offering bribe or favors. Wardens may inspect /enter any room to satisfy themselves that the students maintain high standards of self-discipline and to counsel them as and when needed. Day scholars are not allowed to enter the hostel without the prior permission of the respective Warden. No screaming, whistling or shouting in the hostel is allowed. Within the room the student has the liberty of wearing dress of their convenience. The dress should be decent and acceptable to the hostel authorities. Outside the room and in the dining hall students should wear presentable clothing. The warden’s decision is binding and any argument amounts to violation of hostel rules. Hostel is an integral part of the institution. Any action of indiscipline in the hostel may also attract punishment from the institution. Going to picnics/visits is not permitted. The college or campus house will not be responsible for any accidents or other consequences arising from the visit. Violation of this rule will lead to serious actions expelling of students without any prior notice. It is essential that residents be respectful of each other regarding noise levels in the hostels. All residents have the right to live, sleep, and study without disruption. Therefore, specific guidelines have been set to encourage you to be respectful of your room mates and neighbours. Courtesy hours are in effect all hours of the day. “Courtesy hours” means that noise should not cause disturbance to the occupants of other rooms or buildings. During quiet hours, noise should not be heard outside a room. The students using library facility after 7:00pm have to inform the Warden. Food distribution is done as self-service. Cooking of any kind in the room is strictly prohibited. Student should have food in the dining hall only and are advised not take food items, cups, saucers, plates or tumblers and others utensils meant for use at the dining hall anywhere outside the dining hall or to the rooms. Hostellers may celebrate festivals and birthdays in the hostel premises with prior permission from the concerned hostel authority. However, all the functions / celebrations are to be concluded before 8 pm, and students should confine themselves to their allotted rooms thereafter. There should not be any kind of discomfort caused to other Hostellers and other occupants in the hostel premises. No outside guest(s) or interference of any kind will be permitted. Student should read the rules before signing the application form (A copy of rules is attached with the application form). Request and Authorization letter, documents to be produced if Students are going out for tuition’s, computer courses, project work or training during night to the Unit Manager in advance. Hostel authorities may cancel this permission at any time. Students are allowed to go/stay over the local guardians with prior permission in the prescribed format from the Warden. While returning from the LG’s place, it is expected to produce a signed permission slip. On any special occasion or emergency, student should take permission from the warden in the prescribed format. Students can go out for purchase/entertainment with the written permission from warden and should be back before 8.00 PM on Sundays. Student has to vacate the hostel along with the luggage at the end of each academic year within three days of completion of examination. Students willing to take accommodation for next academic year has to pay the stipulated advance amount and reserve the hostel accommodation. Once the amount is paid, there will be no refunded even if the student changes the decision. Students will be allowed to keep their luggage in the hostel in a prescribed place. It is mandatory for all students to give their attendance between 8.00PM to 9.00 PM to the warden. B ARCH Students are allowed to work in studio with biometric punching in/out with security in hostel OR studio and are not permitted to be in the ground or out of the gate after 8.00 PM. The student should be in the hostel or studio only. The same has to intimate to the warden. Students are not allowed to order food after 9.00pm.